Is it raining in your city? It’s definitely not raining in mine. And there won’t be any rain for the next few months since I live in Dubai, UAE. Rain here, is often a result of year round Cloud seeding by the government and mostly happens during winter months. It brings down temperatures in the desert country and believe me nothing makes people in the UAE happier! The roads may get flooded due to the lack of storm-water drainage facilities in most areas but they don’t care. Okay, maybe a long weekend and a discount on traffic fines makes them really happy too, but when it rains, people’s happiness knows no bounds. And how do we celebrate this occasion in our home? Why, we make some Karak Chai and Aloo Pyaaz ke Pakode of course! This is a standard drill when we hear rain clouds thundering and feel cool moisture laden winds blowing. We start preparing the batter for Pakode and mid way through the process keep a pot of chai so that we finish making the chai and all the pakodas at the same time to serve them hot! 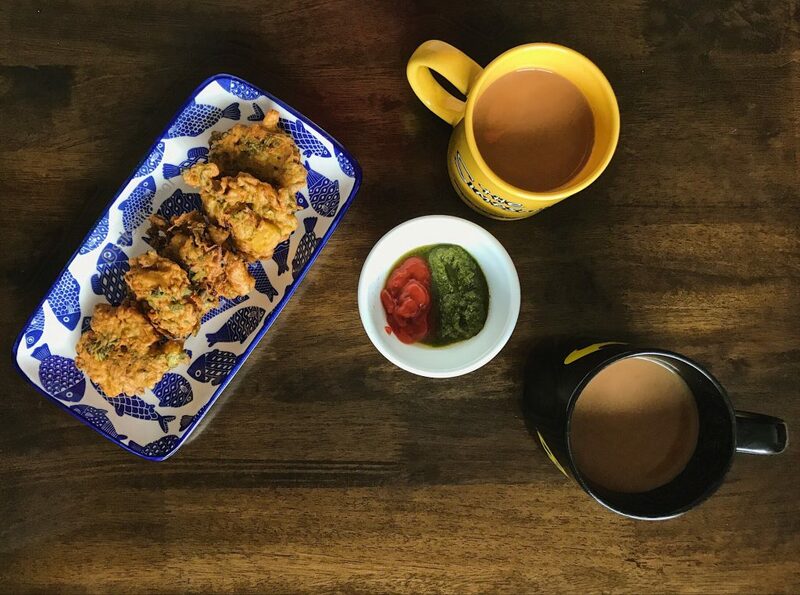 Karak Adrak wali Chai with some Pakode are the comfort food of many during the rainy season or Sawan ka mahina. The pitter patter of raindrops and the occasional lightning and thundering of clouds sets the perfect scene for keeping a sizzling hot kadhai on the stovetop and frying some pakode. That, along with some chai brewing alongside. Even though it doesn’t rain here in the UAE at the same time as the Indian Monsoons, the news of rain lashing our hometowns from friends and family does make us crave some Pakoras. 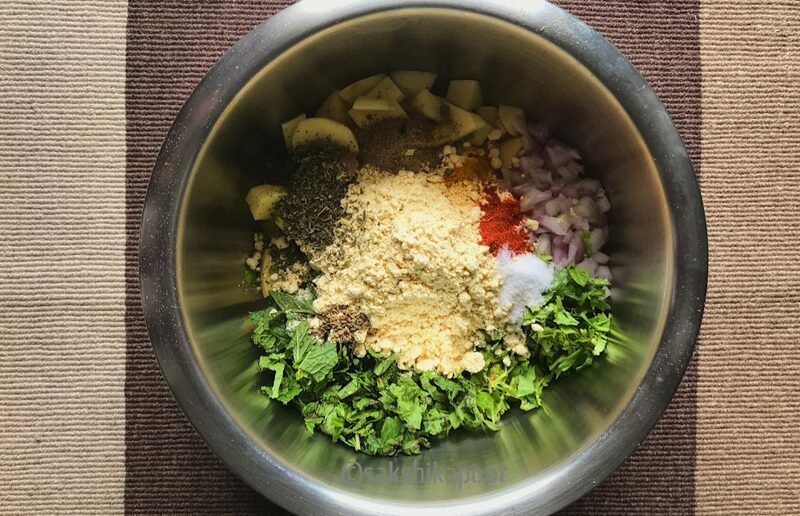 I’m sharing my mom’s Aloo Pyaaz pakode recipe here which she prepares at the drop of a hat because it only uses her pantry staples. Since I have learnt all the workings of a kitchen from her (Don’t we all learn this from our moms!) I keep the same kind of pantry staples as her like basic flours like atta, sooji, besan, grains, pulses and veggies like Potatoes, Onions and Tomatoes. Like my mom’s kitchen, I also always keep a stock of Aloo, Pyaaz and Tamatar. When making a grocery list, we usually say Aloo-Pyaaz- Tamatar in one breath because they are such important items in our pantry. Onions and Tomato form the tadka or the base of most curries in my house and make preparing meals easy. Potatoes go with so many other veggies to make delicious side dishes like Aloo Gobhi, Aloo matar, Aloo beans and so many more. 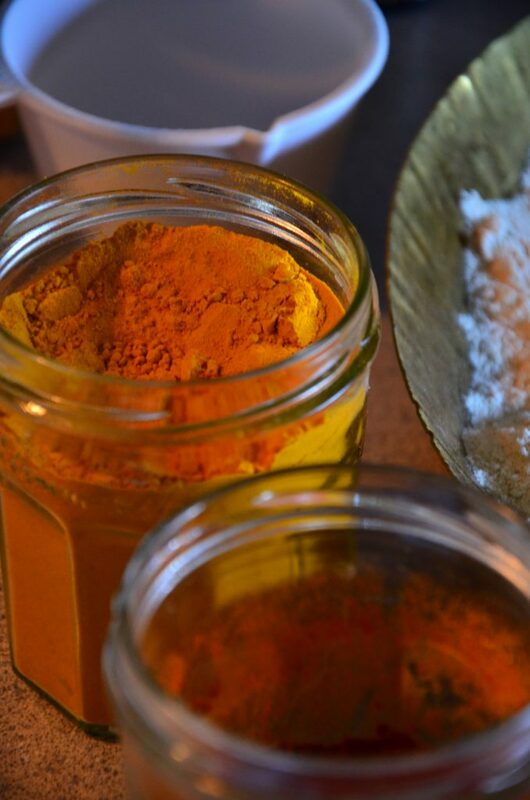 Like fellow blogger Chef Mimi says in one of her blog posts, if you want to cook more often or become a successful home-cook, keep your pantry stocked! 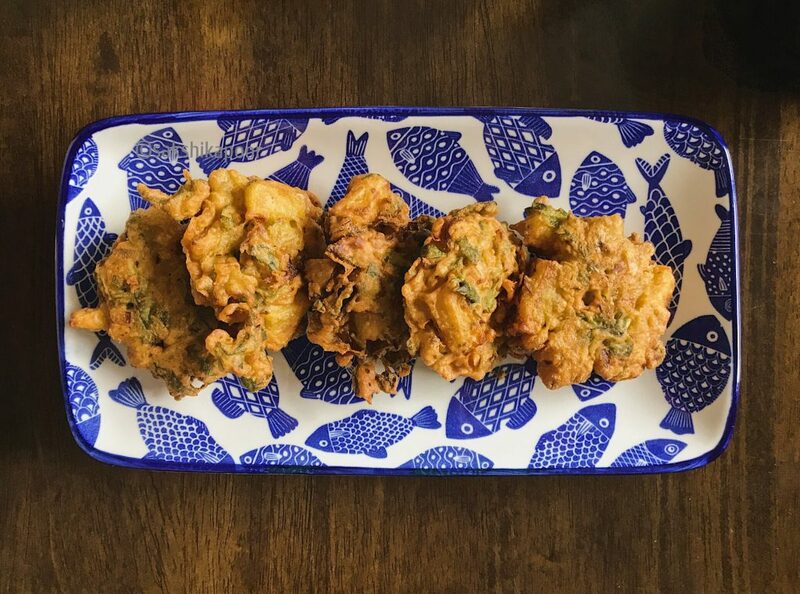 These Pakodas are made with just some of things amongst many that I keep in my pantry. Peel the onions and the washed potatoes. Dice the onions and potatoes in a medium dice for the pakodas. Now clean, wash and dry the Coriander and Mint leaves, if you are using them. You can use the stems for the coriander too. Once dry the herbs, fold and chop them roughly. 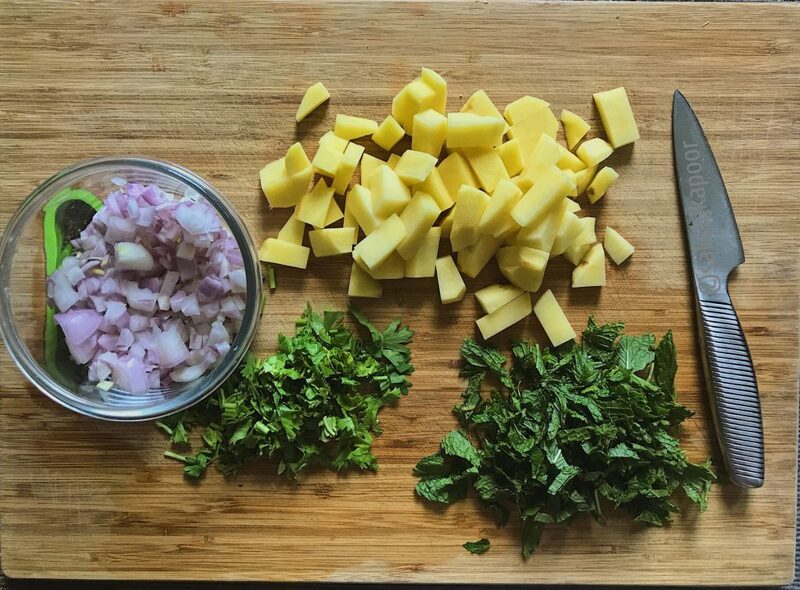 Next, transfer the diced onions, potatoes and the chopped herbs in a deep bowl. Add the besan flour, salt, red chilli powder, turmeric, chaat masala, carom seeds (ajwain) and kasoori methi to this bowl. Gradually add water and start stirring. You will notice that this way of making pakodas does not result in a lumpy batter. Mix well and adjust the consistency of the batter with more water (or even more Besan) till you see the veggies are coated well in the batter. The batter shouldn’t be too runny though. Now that the batter is ready, move on to the process of frying the Pakode. Place a deep kadhai on medium high heat and pour Vegetable oil in it. Wait for the oil to heat. Once you think the oil is hot, which should be in 4-5 minutes, test it by placing a tiny bit of the onion in the oil with the help of a spoon. The test pakoda should rise to the top and float while it sizzles. If it doesn’t then it needs to heat up more for which you should a couple of more minutes. Once the oil is hot, scoop out a spoonful of the veggie batter mix and very gently place in the oil. 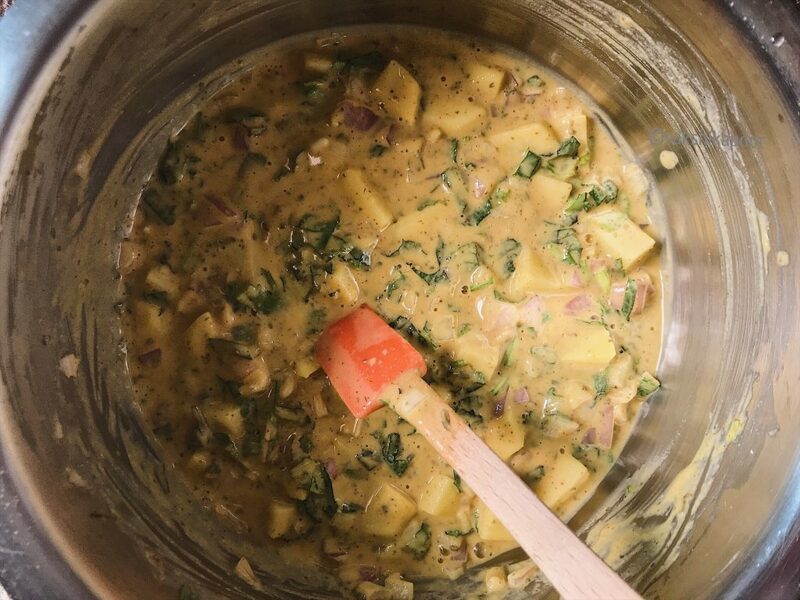 Do not spread the batter in the oil, rather just tilt the spoon in one place so that all batter pours into one place and coats the veggie mix. You can pour more spoonfuls alongside in the Kadhai if your kadhai is big enough. Once you are halfway making the pakodas from your batter, start boiling the water for your tea on the side. By the time you finish making all the pakodas from your batter, your tea would also be ready and you can serve while chai and pakodas are still hot! Let the pakode cook till you see the batter on top is no longer wet. Then gently turn the fritters upside down using a deep frying skimmer. Cook till you see the Pakode become golden brown. Take the Pakode out of the hot kadhai and drain on a plate lined with kitchen paper towels. Repeat the process with the rest of the batter. Serve Aloo Pyaaz ke Pakode hot with hari chutney, some ketchup and a steaming cuppa of Karak Chai. Peel the onions and the washed potatoes. Dice the onions and potatoes in a medium dice for the pakodas. Gradually add water and start stirring. You will notice that this way of making pakodas does not result in a lumpy batter. Mix well and adjust the consistency of the batter with more water (or even besan) till you see the veggies are coated well in the batter. The batter shouldn't be too runny though. Now move on to the process of frying the Pakode. Place a deep kadhai on medium high heat and pour Vegetable oil in it. The test pakoda should rise to the top and float while it sizzles. If it doesn't then it needs to heat up more for which you should a couple more minutes. Serve Aloo Pyaaz ke Pakode hot with some hari chutney and a steaming cuppa of Karak Chai.